Search Of Stricken Italian Cruise Ship Resumes After Third Delay : The Two-Way Search and rescue operations at the wreck of the Costa Concordia have resumed, after being halted for a third time, due to choppy waters and the partially submerged vessel's tendency to shift on the rocks near Italy's coast. A coast guard boat passes the Costa Concordia, as the cruise liner lies aground in front of the harbor of Giglio Island. "Sensors placed on the ship show it has shifted about an inch every two hours. "The boat's instability forced a Dutch salvage crew to delay the pumping of half a million gallons of fuel out of the vessel's tanks. "The shipwreck a week ago – and its tales of apparent cowardice by the captain and the courage of many crew members and islanders — has mesmerized the country. "The grounding of the biggest passenger ship ever in the Tuscan marine sanctuary has also prompted calls that big cruise ships be banned from passing too close to islands and shorelines. "That would eliminate one of the key selling points of Mediterranean cruises – close-up views of the Italian coast, from the Riviera to Capri and Amalfi, from Sicily to Venice." The ship's captain decided to perform the close-in maneuver without informing anyone at the cruise liner's operating company, according Pier Luigi Foschi, chief executive of Costa Cruises. Foschi told Italy's Corriere della Sera that sailing close to the shore is sometimes done as a favor to tourists — but that he had never heard of a captain choosing a risky course. "Personally, I think he wasn't honest with us," Foschi said, in a translation from Italian by Reuters. The CEO also insisted that cost concerns played no part in how the emergency was handled. Critics have accused the company of urging the crew not to abandon ship, due to the potentially high costs. "I assure you absolutely that no one thought in financial terms. That would be a choice that would violate our ethics," Foschi says, according to Reuters' translation. Reports emerged Thursday that musician Sandor Feher, 38, died aboard the sinking ship after helping children put on lifejackets. Feher, who had reportedly worked on the ship for about a month, was lost after he went back to his cabin for his violin. 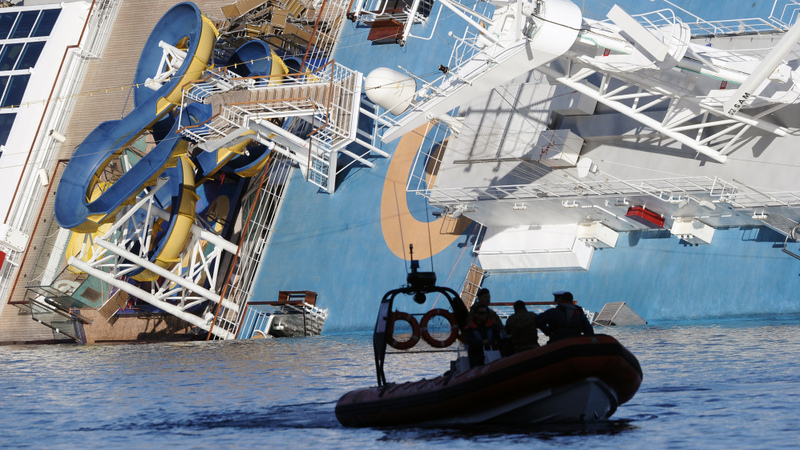 The ship's final fate is difficult to predict, as our colleague Scott Neuman noted in a story for NPR Thursday. "Removing a massive ship that's run hard aground and incurred major damage... involves logistical and environmental issues" that complicate things, Scott wrote.